Branded tote bags are a promotional staple, and with good reason. 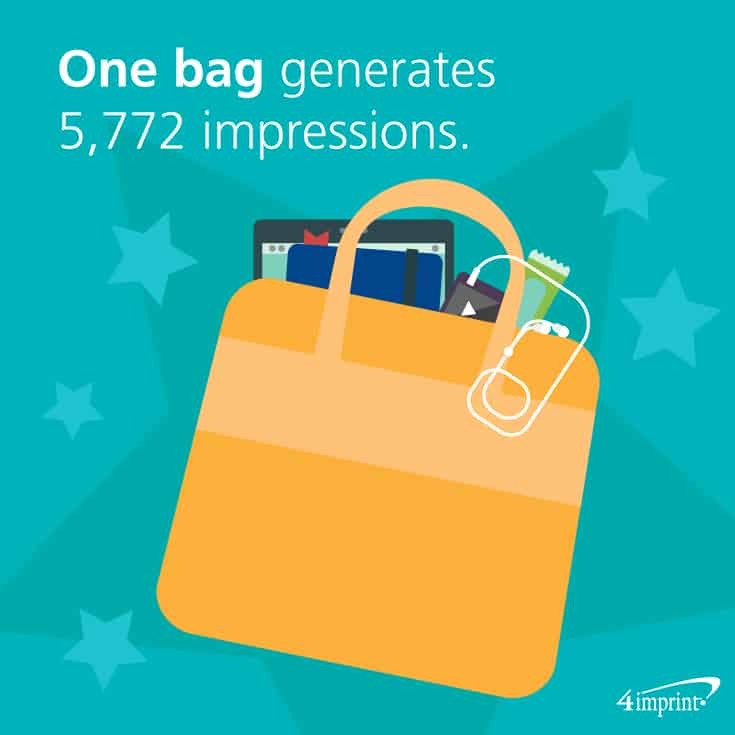 According to a study by the Advertising Specialty Institute (ASI), a single bag generates 5,772 impressions. That’s almost as many impressions as the second (hats) and third (pens) most popular promotional items combined. The term “tote bag” may mean different things to different people—like an inexpensive way to carry groceries or a sturdy bag you take to the beach—but in reality, there are an infinite number of variations on the classic tote. Whether you need a budget-priced swag bag, a premium tote for a special client or employee, or something both price-conscious and unique for a special event, we’ll help you pick the best promotional bag for your brand and price range. 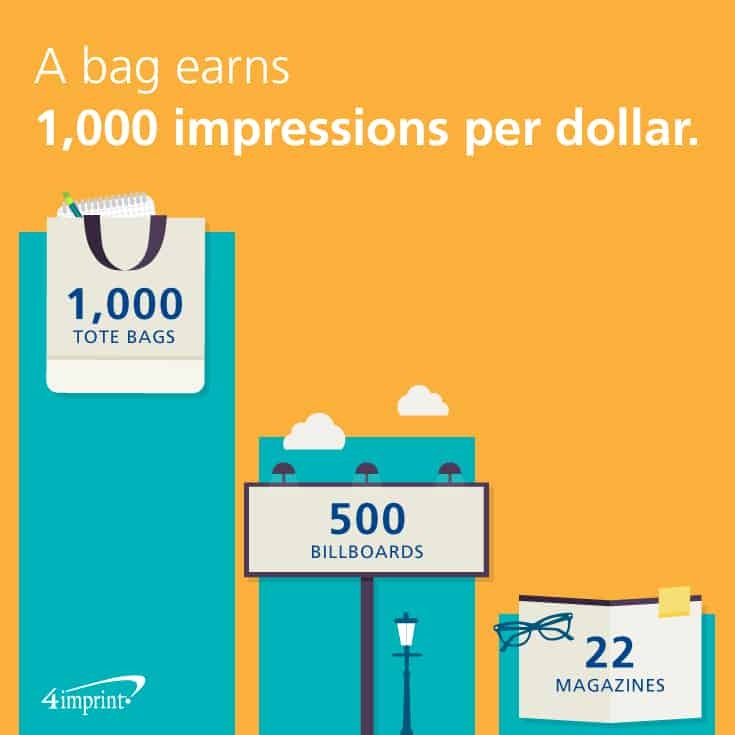 Studies have shown that a bag earns roughly 1,000 impressions per dollar spent, compared to 500 impressions for billboards and 22 for national magazine ads. 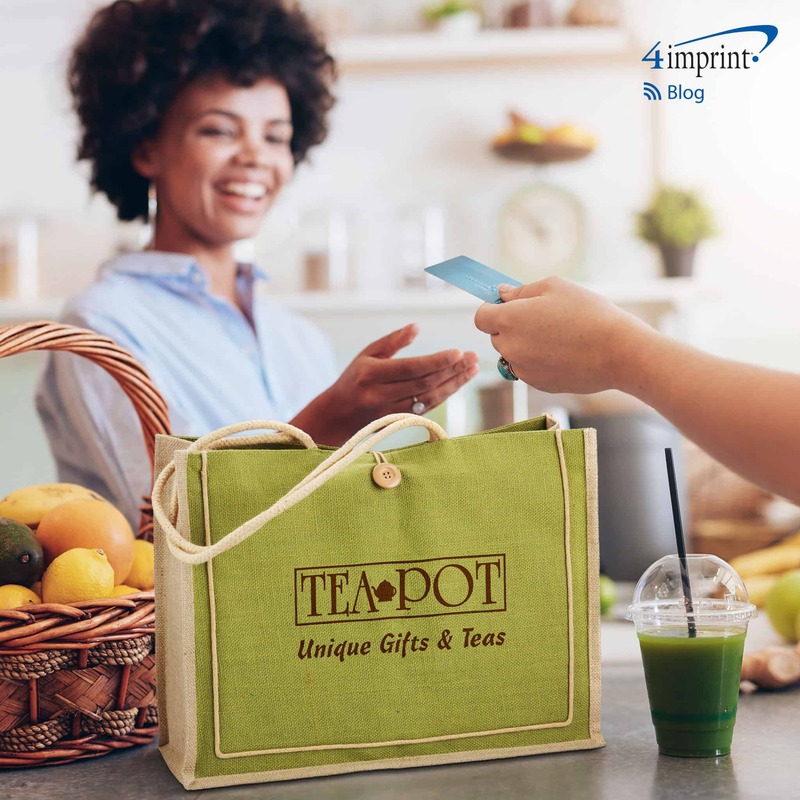 That makes tote bags an excellent way to stretch your budget, especially when you need a large number of promotional items, such as at a trade show or a large sporting or business event. Even with limited resources, it’s still possible to offer a quality, useful promo that recipients will want to continue to use. The Value Grocery Tote has all the best qualities of the classic tote bag, including double-reinforced handles and a board bottom to provide stability. If you want something with a natural flair, try the Cotton Sheeting Natural Economy Tote. It’s simple but useful. For an entirely different type of tote that’s still incredibly budget-friendly, consider the Lunch Sack Tote. Almost everyone can use a durable lunch bag. 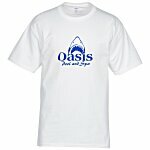 It is perfect for a school function or company picnic. If you have a larger marketing budget, a smaller group of recipients or a special event that requires a unique giveaway, mid-level bags can be useful and memorable while still being price-conscious. If you’re holding an open house for employee families, or just want to encourage your customers to show off their artistic side, the Color-Me Activity Tote with Crayons is sure to delight. It’s the bag they get to color themselves! If your business is hosting a sporting event or sponsoring a local youth sports league, there are bags for sports fans of all ages. The Clear Game Tote is designed to comply with NFL® regulations, making it the perfect bag to carry on game day. There are also specially designed bags for just about everyone who likes to throw, catch or kick a ball, including the Baseball Tote, Basketball Tote, Soccer Tote and Football Tote. If you’re looking for a bag with natural fibers, look no further than the Milan Jute Tote, with cotton rope handles and a button loop closure. 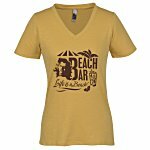 It looks great at the beach or the office. For a bag they’ll carry every day, try the Boardwalk Convention Tote or Fun Tote. Both look great and feature a mesh water bottle pocket and an extra pocket for pens, a phone and other items. Shoppers will surely appreciate the Therm O Tote Insulated Grocery Bag. It’s a grocery tote with insulation, allowing them to keep hot items hot or cool items cool. 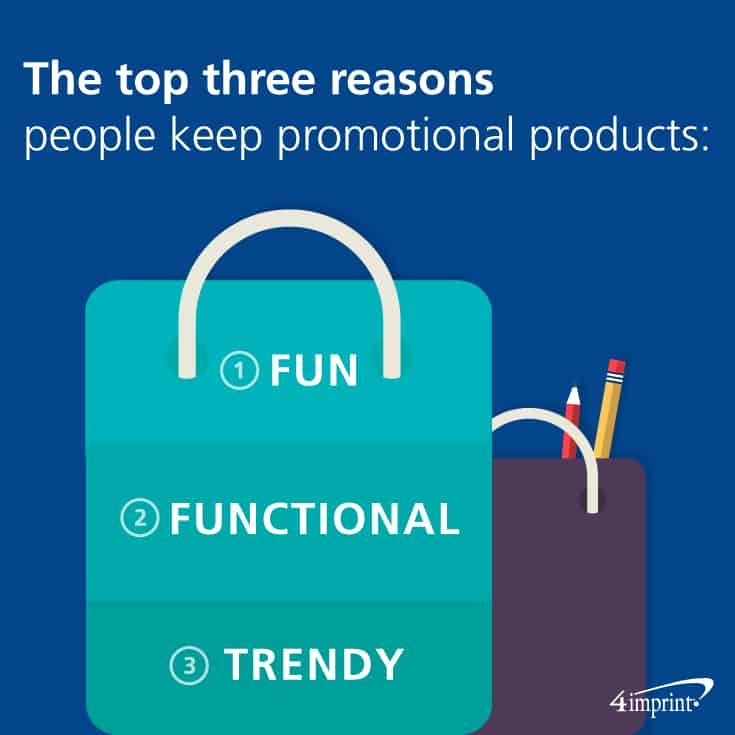 According to PPAI, the top three reasons people keep promotional products are if the products are fun, functional or trendy. And branded tote bags can easily be all three. There is a wide variety of premium bags for those times when you need to offer something extra special. New employees will appreciate the Daily Commuter Laptop Tote. It will help keep them organized and looking sharp. If you want to offer a client a thank-you gift for their business or congratulate an employee on a work anniversary, the Alternative® Victory 15″ Laptop Backpack Tote or Cutter & Buck® Legacy Cotton Boat Tote combine popular brands and your logo into one beautiful bag. There are probably as many reasons to offer branded tote bags as there are variations to choose from. But whether you’re giving away hundreds of totes to raise awareness for a nonprofit or offering a high-end bag to congratulate an employee on a work anniversary, the best promotional bags will always be the ones that fit your message, your budget and your brand. 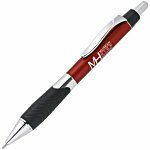 Looking for affordable giveaways customers will love without breaking the bank? These 4imprint Value Buy items help you make the most of your marketing budget.